Heigh ho heigh ho off to work I go! The last day of green harvest! I began my morning at 6 am to work the last day of green harvest from a single vineyard of Barbera grapes. The vines were planted in 1998 and are about 5000 plants per hectare or 2.4 acres. The day was long (about 9 1/2 hours) and very hot. I finished the day sunburned and sore but it was very rewarding. I have so much respect for the many men and women who work the fields on a daily basis. It really makes you think about how much hard work goes into your glass of wine. The next time you pop the cork maybe you will join me with a big cheers in their honor! We are settled in Piemonte after traveling for over four months visiting different wine regions and visiting our favorite producers. I have enjoyed every part of this adventure but the real reason we are here is to work the harvest. I followed my winemaker (LC) around yesterday and I learned how to cut for a green harvest. I also visited our vineyards in Barberesco and in Asti. I was taught how to taste the grapes for analyzing the skins for color, and seeds for tannins. It seemed like I ate my weight in grapes but I did get an understanding of the different clones, soil, affect the pH, sugar content and total acid content. According to Wikipedia, a green harvest is the removal of immature grape bunches, typically for the purpose of decreasing yield. Green harvesting is a relatively modern practice most often used to produce fine wine. Removing the tiny, immature grapes while they are still green induces the vine to put all its energy into developing the remaining grapes. In theory this results in better ripening and the development of more numerous and mature flavor compounds. In the absence of a green harvest, a healthy, vigorous vine can produce dilute, unripe grapes. I was taught that it is important to have one cluster per cane and no more than six clusters per vine. You also need to factor where the grape cluster is positioned. For example if there are two cluster on a cane you would leave the grapes that are closer to the base because it tends to receive more energy. The art of deciding which grape cluster gets the cut and how many to leave. 80 year old Nebbiolo vine. This is at the beginning of the morning which started a 6:45 am but by 3 in the afternoon I had drunk four bottles of water, was drenched in sweat, had stepped in mud, was followed by bees, and had walked in a few spider webs. To me, it was a perfect day! Would you believe that the next two photos are two separate vineyards by very well known producers (I will not reveal their names, but I was shocked.) Both are planted with barbera but it is unbelievable that the Vineyard #1 is so overgrown. Vineyard #1 is in need of some TLC. Fresh from the garden next to the Lazzarito vineyard. Fresh zucchini, zucchini flowers, melon, and hazelnuts. This was filmed in Bolgheri after a wine tasting in May. I will just blame the wine for impairing my ability to conquer that stubborn dandelion! 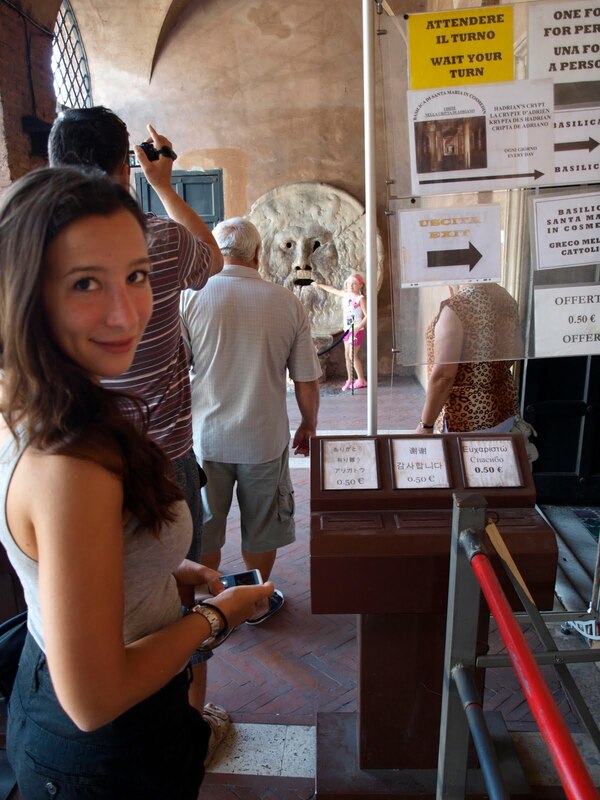 On a recent visit to Rome I had to make a quick stop at La Bocca della Verità (The mouth of truth). I have always been a huge fan of Audrey Hepburn and her movies which includes the 1953 classic, Roman Holiday. I am especially fond of the scene when Gregory Peck and Audrey Hepburn arrive to the mouth of truth, a face carved in marble. Joe (Gregory Peck) tells Princess Anya (Audrey Hepburn) the legend of the mouth. It has been said that if a liar puts their hand inside its mouth, they will lose it. When filming the scene Gregory Peck played a trick on Audrey by hiding his hand inside his sleave and than he pretended to have his hand bite off. This little prank caused Aubrey Hepburn to scream for real and if you examine the clip she was not acting and was really laughing from being caught off-guard. Here is a clip from the movie in Italian. waiting in line for my chance to place my hand in the mouth. If you visit Rome I would recommend you visit it. It is now located in the atrium of the ‘Santa Maria in Cosmedin’ church.